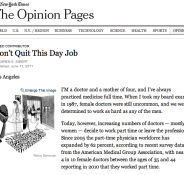 The New York Times picked up my opinion piece about women in medicine. I enjoy your writing and certainly see your points in this article. Though I am not sure that I completely share your views as to “ownership” of the privilege of a medical education. Though it is a privilege to get a medical education and then there is a duty to serve–doesn’t that honor and duty still basically belong to the person who worked and continues to work to achieve this? That’s my humanist side speaking. In fact, patients do often need and get a physician to lead their health care team. But are nurse practitioners and physician assistants less than a “fully qualified doctor” when they are not doctors at all? Lets describe these practitioners as what they are –fully qualified nps or pas, not as something less than what they never tried to be in the first place. Thanks so much for writing, and for your kind comments about me on your blog! What you say about NPs and PAs is perfectly true, and no disparagement is implied. However, many people in government and hospital administration are looking to cut costs by using NPs and PAs INSTEAD of physicians, not as they were intended–as physician extenders and colleagues, working together. Nowhere is this more evident than in the evolution of the nurse anesthetists’ lobby. Go to the AANA website if you think I’m exaggerating. 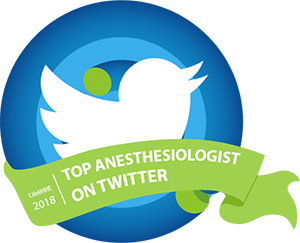 Nurse anesthetists truly believe they can and should function without any physician involvement at all, despite the obvious differences in education and training. Best of luck! Please continue reading, and I’ll follow your blog with interest. Very nice article. 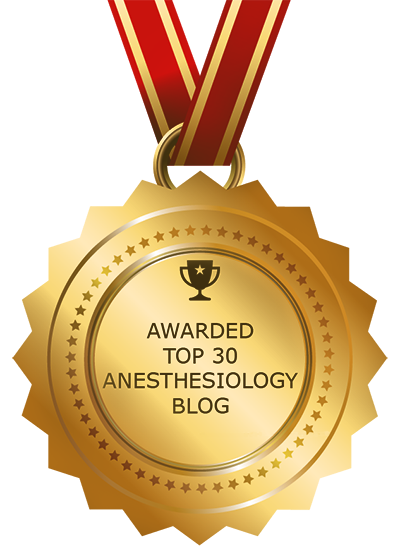 As a practicing anesthesiologist in a rural setting I stumbled across all the blogs that you have written about including skeptical scalpel, Kevinmd etc. I also follow Malone malpractice lawyer website. Anesthesiologists are having to work very hard and take care of sicker patients and work night shifts. This takes it’s toll on the physical health/ emotional burn out. Here work life balance is very important to younger physicians. The hospital environment abuses anesthesia providers. Why do I have a moral obligation to the society when the society doesnot acknowledge my value? It’s not about the money. It’s respect that we deserve for sacrificing personal life. I don’t want a full time corporate job in a corporate hospital that has no loyalty to me. Moreover these hospitals have made no investment on the physicians and can fire them for frivolous reasons. All the more reason to do part time jobs in different hospitals. It just cannot be status quo that the hospitals make all the profits at the expense of hard working young doctors/nurses. As a tax payer I want to know how these so called non profit hospitals get paid? We need to reform, educate the general public, politicians.